Well I made it through Hubby’s birthday and Thanksgiving. More about Thanksgiving later. Charlie and I are doing okay. We have our good days and not so good days of course. Charlie seems more resilient than me about missing Daddy. For Hubby’s birthday we didn’t do anything. Hubby’s sisters, nephew and great-nephew celebrated it in style though! Apparently Hubby would take his nephews out to wrap houses when they were in high school. This is not surprising considering Hubby is only about 10 years older than his oldest nephew. He took them to their first concerts, bought them their first beers, and other corrupting influences on the boys. The boys were NOT above wrapping their own parents houses by the way. SO Hubby’s oldest sister, the ring leader, thought it would be a great way to remember “Uncle Robert” by wrapping his nephew’s houses. I had absolutely no idea this was going to happen. Total deniability until after the deeds were done! 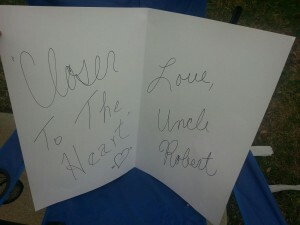 My sister-in-laws even left a note for the boys from “Uncle Robert” in his memory. The kids loved it! I think it was a wonderful way for them all to celebrate Hubby’s birthday.